The TranStar Pipeline Inspection Transporter is the most powerful tractor of its size in the industry. 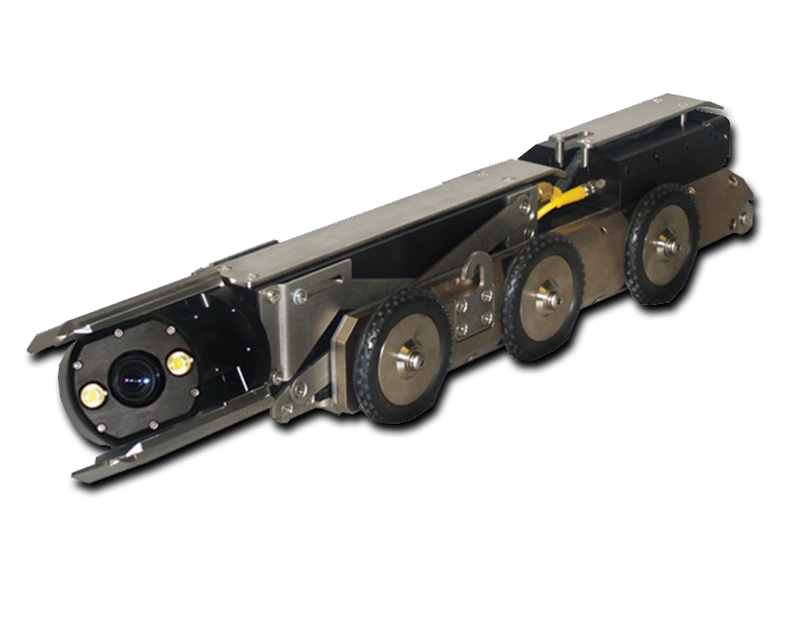 This robust, steerable transporter features six wheels for sure footing during inspections. The all-gear-driven tractor is powered by two 90W rare-earth permanent magnet motors, allowing it to inspect larger lines without the need for additional gear trains or transmissions. The clutch allows rapid freewheel retrieval once the inspection is complete so production capability is greatly optimized. The 19-inch long TranStar offers tremendous versatility through many standard features and options. Most powerful tractor of its size with dual 90 watt motors. Water resistant per ipx7 requirements. Tilt-up connector for ease of deployment. Capable of distances of 2,000 feet in a single run. Three forward speeds, reverse and freewheel. Manual or motorized elevator systems. Axle adapters for large-pipe inspection. Multiple wheel sets for optimum combination of height and traction in any pipe.